Plastic surgery on eyelids is a popular cosmetic reconstructive surgery, which corrects condition of the upper and lower eyelids. As a result of blepharoplasty the excessive fat and skin, as well as muscular tissue of upper and lower eyelids are removed. The effect of ptosis of upper eyelid, caused by a weak muscular tone or injury of muscular nerve is eliminated. Excessive skin and fat around your eyes create illusion of weariness, inflammation or of more mature age, and ptosis leads to limitation of peripheral sight in the upper and lateral areas. Many people have the inherent heavy, lowered upper eyelids, and also strongly swelled up bottom eyelids, though for the majority of us it is a sign of natural aging. Plastic surgery on eyelids improves appearance, expands area of peripheral sight and in many cases lowers intraocular pressure, especially for people using forehead muscles for lifting of unduly lowered upper eyelids. As a result of plastic surgery on eyelids you shall have a possibility to gain maximum aesthetic effect with the minimum invasive syndrome. 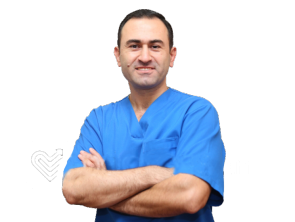 Today it is one of the most numerous and exact surgeries of face. Blepharoplasty does not eliminate “goose pads”, does not lift beetling eyebrows, does not delete dark circles under the eyes and small mimic wrinkles (for this purpose there are other methods). Ideal candidates for blepharoplasty are physically healthy, emotionally steady people, who are well informed about the surgery. These are patients who are realistic in the expectations, with medical indications typical for this procedure. The age, at least, shall be over thirty five. However there are no obstacles for solving existing problems at an earlier age too, especially in case of presence of difficult forms of inherent diseases of eyelids. Contra-indications: raised blood pressure, hypothyroidism, serious cardiovascular diseases, diabetes, glaucoma, Graves disease, detachment of retina, xerophthalmia and diseases of a thyroid gland. Counter-indications may also be conditioned by specific anatomic features of your body interfering with performance of the surgery. The obligator condition for this surgery is discussion of any medical problems with your ophthalmologist prior to taking the decision on carrying out blepharoplasty. Preparation for surgery begins with passing a full medical examination and ends with the complete list of recommendations for the postoperative period. At carrying out preliminary examination, therapist draws the conclusion about absence of somatic pathology leading to hypostases of eyelids. The ophthalmologist estimates the patient about quality of sight, a condition sclera, eye pressure and functionality of the lacrimal apparatus. If an insufficient efficiency of the lacrimal apparatus is detected the surgery shall not be carried out. It is not the least important to pay attention to the general physical condition of the patient. In particular, quit smoking, drinking alcohol, administration of hormonal and psychotropic preparations. Special attention must be paid to abstention from administration of medication ten-fourteen days prior to blepharoplasty, because it increases risk of bleeding. It is preferable to carry out the surgery at the beginning and the middle of a menstrual cycle. Preparation for surgery also includes joint discussion of wishes of the patient and possible realization of those. On the day of surgery, antibacterial and antiviral medications are prescribed for administration, with continuation of it for about five days after the surgery for the purpose of prevention of a virus and bacterial infection. Food ingestion shall be stopped six hours prior to blepharoplasty. Plastic surgery on eyelids is a relatively painless procedure. Operation is carried out under the general or local anesthesia. The technique of the surgery is individual for each patient and is conditioned by the personal surgical plan. The choice of anesthesia, in many respects depends on individual features of the patient, and also on the planned volume of operative intervention. The anesthesiologist will apply the treatment, allowing you not to feel any pain during the entire surgery, guaranteeing your full safety and the minimum postoperative discomfort. The procedure usually takes from one to three hours, depending on complexity of blepharoplasty. We distinguish blepharoplasty of the upper and lower eyelids. Usually the surgeon carries out sections on natural folds of upper eyelids, and slightly below the eyelashes on lower eyelids. Sections are carried out by a traditional scalpel or by a laser. The top sections go along the eyelid, from internal corners to external edge. The surgeon removes excess skin and fat in quantity necessary for receiving desirable result. Prolapse of eyelids skin is often aggravated with shift of excess tissues of the forehead below the line of eyebrows. In that case, to achieve positive cosmetic effect, the surgeon needs not only to remove excess skin of upper eyelids, but also to raise the line of eyebrows. The best effect in such cases is achieved by blepharoplasty of upper eyelids at the same time with endoscopic forehead uplift. As a result of operation the surgeon will straighten the skin over upper eyelids, will remove its excesses, will lift the eyebrows which hang over eyes and will smoothen the forehead skin. At plastic surgery of lower eyelids the operational section is carried out directly under ciliary edge or from the interior of a lower eyelid. The second type of a section is called transconjunctival. It is a more modern method which is not leaving any visible scars. In the area of lower eyelids there is a prolapse of soft facial tissues because of eventual stretching and weakening of ligaments of muscles. These changes look as lowering of the lower eyelid, extension of the lower portion of the muscle, surrounding the eye, emergence of “sacks” under your eyes, when intra- orbital fat isn’t kept in an eye-socket orbicular muscle of eye and the weakened orbital septum. Depending on defects, the surgeon in an individual order selects the mode of lower eyelids blepharoplasty. If it is necessary to eliminate excess skin and fatty “hernias”, a section from outer side of an eyelid directly under the line of eyelashes is usually made. Through such sections excess of fatty tissue is removed, and then excess skin is removed. When there is no excess skin, the transconjunctival method of blepharoplasty is selected. Such option is ideally suited for young patients, where the problem is only about for whom the problem is only about eye-sacks. Excess of fat is removed by means of the laser. Further, sections are closed up with tiny stitches, which are taken out in a week, at the most. Insignificant bruises which usually reabsorb by the end of the week, are possible. No special surgical debridement is necessary. The structure of paraorbital area substantially differs from all other parts of a human body. In the area of upper and lower eyelids, a muscle lies immediately under the skin – m. orbicularis okuli, whereas in all other zones of a human body directly under the skin there is a layer of hypodermic fatty tissue. Due to this, the blood supply of the upper and lower eyelids is much better and process of healing passes much quicker. After operation blepharoplasty the patient usually remains in clinic for one day. Within three-six hours after completion of procedure, bandages are placed upon eyes, with subsequent imposing of cold compresses. To the majority of patients antibacterial drops are prescribed for the first few days. Post-surgical stitches are taken out in three-seven days with further use of protective stickers on suture line. The majority of patients can return to work in seven-ten days, with obligatory use of decorative cosmetics and sun-protection creams. Wearing contact lenses is not recommended within first two weeks, and the make-up can be used not earlier than in ten days. Thin post-surgical stitches turn pale and practically disappear completely in two-three months. Bruises reabsorb much quicker, usually within ten – twelve days, hematomas on eye whites can remain slightly longer, about three weeks. On the initial stage of recovery it is necessary to avoid the increased physical activities, active sexual contacts. Starting from the second day after the surgery special exercises for eyes are to be performed. Exclude alcohol and TV for the entire post-surgical rehabilitation period.